Unlike the other die cast releases, this figure comes with a good amount of accessories but also follows some trends from past die cast releases. 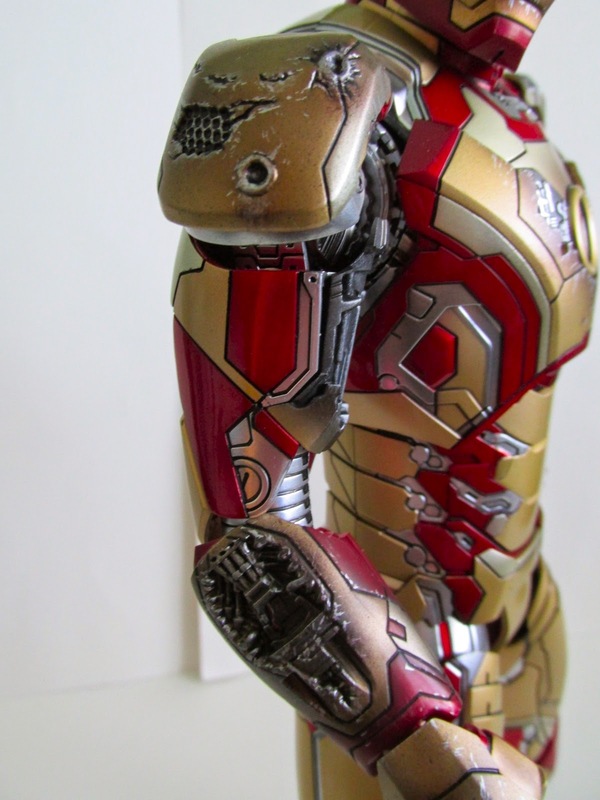 The biggest accessory are the pieces of battle damaged armor. 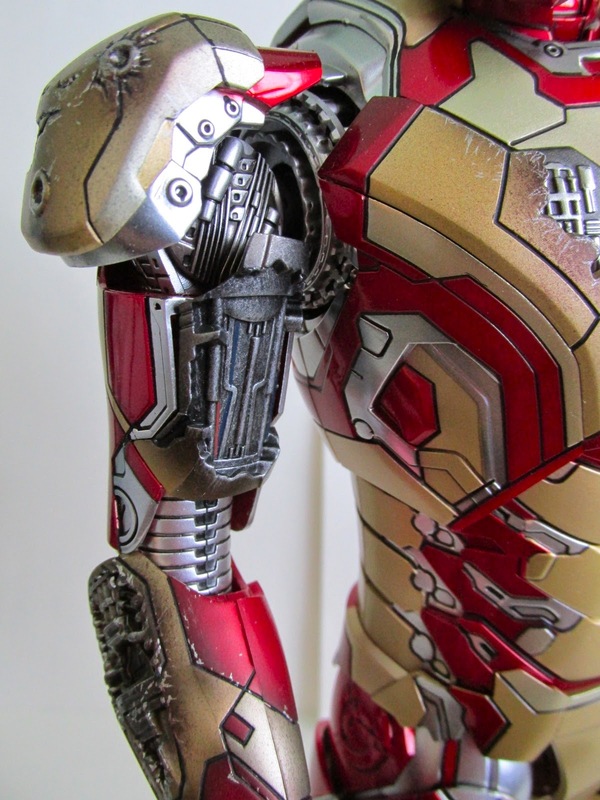 The battle damaged armor is fairly simple to switch because of its magnets so no worries on breaking the armor. 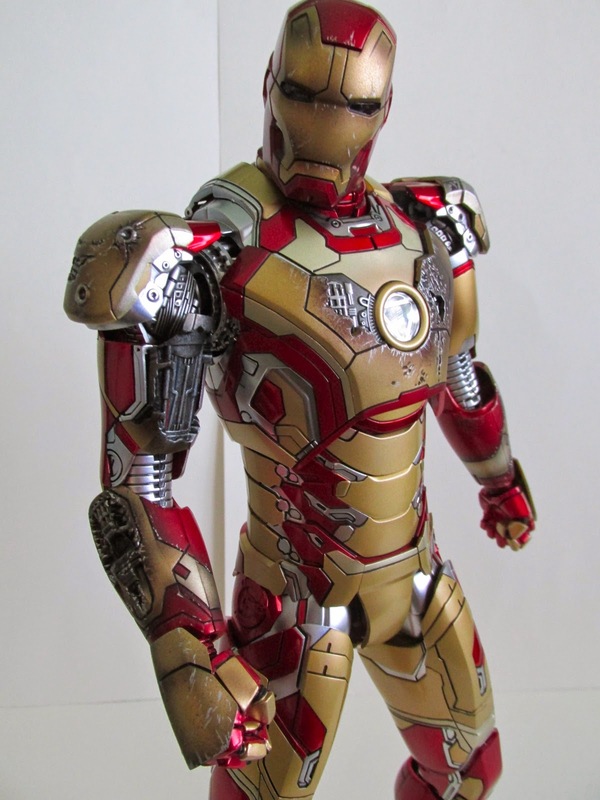 The battle damaged armor is unfortunately all made of plastic while some of the clean armor is made of metal, which might be a nit picky thing to point out. Overall though, the armor looks great and functions quite well. He also comes with a right gauntlet with a missile showing and ready to fire. Unfortunately, like other die cast releases this figure only has the missile gauntlet for the right arm and not the left. 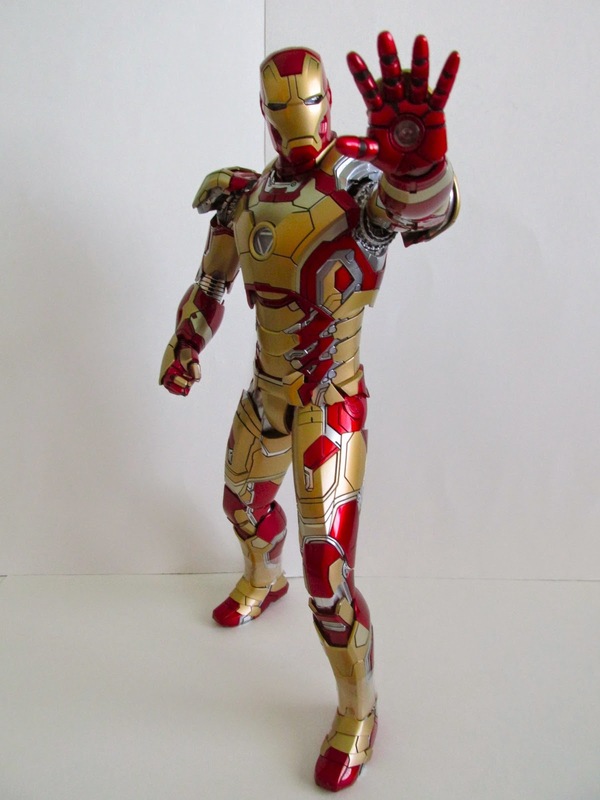 Another accessory is the alternate head featuring Tony Stark’s face. This face is used for the battle damaged look and like the movie promo mark vii you can flip up the face plate to reveal his face. This time though you can actually put the face plate over his face and not have to worry about it fitting correctly. 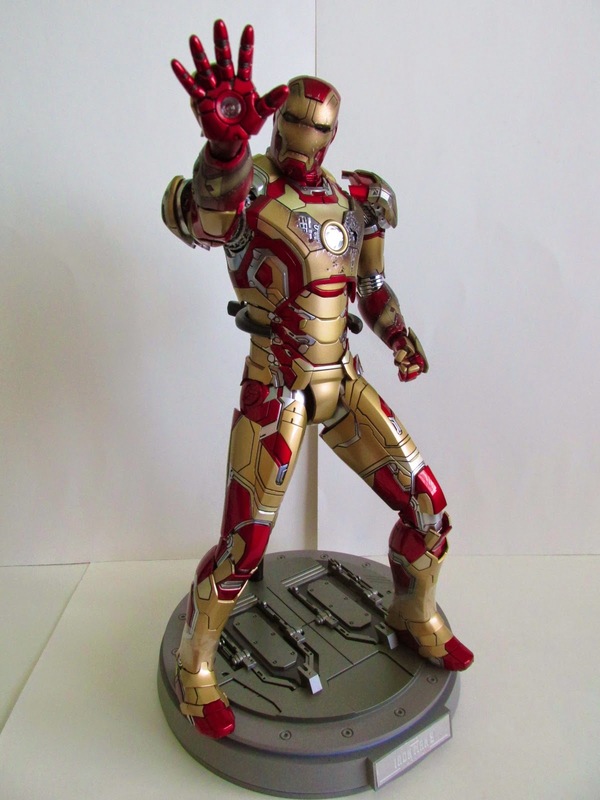 I’ve tested it out and The Mechanic Tony Stark head will not fit on this figure. It has different joints that do not work with this figure. Surprisingly, the booty of the armor is made of rubber. This was made so you can push the button on the booty in order to make the legs bend farther to produce the kneeling down look. I’m only worried that the paint might fade, but we will see. One thing to watch out for are the arms. When moving the arms, you must be very careful to not rub up against his back flaps. The flaps sometimes hinder the arms from moving and if you don’t do it right you might scratch or break the flaps or arms. Please use caution. Overall, I’m loving this figure. 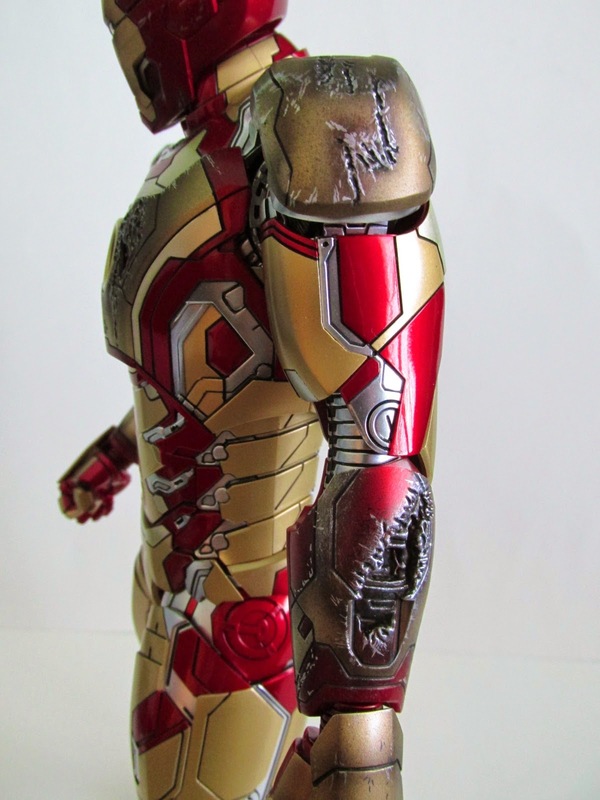 He looks great in either the clean look or battle damaged look and it really has a presence among the other Iron Man armors. You can buy him here at this link!